from any organization, in any weight division and at any time. Hall of Fame Induction: BJ Penn Jul 11, 2015 (22:46) "The Prodigy" BJ Penn speaks at the 2015 UFC Hall of Fame Induction Ceremony. BJ Penn vs. Matt Hughes UFC 123 Nov 10, 2010 (13:47) BJ Penn rising to 170lbs to challenge Matt Hughes, one of the top fighters in the world, was seen as crazy by most. Someone forgot to tell Penn though, who planned to fulfill his exceptional promise. BJ Penn vs. Diego Sanchez UFC 107 Dec 12, 2009 (43:20) Diego 'Nightmare' Sanchez got his first shot at the UFC Lightweight title against longtime champion BJ Penn. 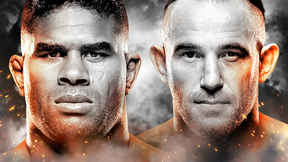 Would Sanchez be a nightmare for 'The Prodigy,' or would he be just another victim in a long line of title defenses? BJ Penn vs. Joe Stevenson UFC 80 Jan 19, 2008 (3:58) BJ Penn and Joe Stevenson went to battle for the vacant title in the Lightweight division at UFC 80. Penn looked to finally capture that elusive 155 lb crown while Stevenson was on a mission to be the second TUF alumni to hold a belt. BJ Penn vs Sean Sherk UFC 84 May 24, 2008 (13:10) Sean Sherk returned to the Octagon™ to reclaim his title after serving a suspension for testing positive for a banned substance. 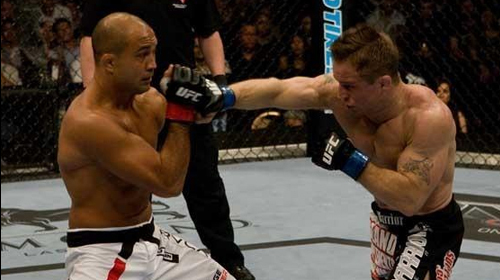 After much pre fight hype, the time for talking was over and it was time to find out who was the UFC® Lightweight Champion, BJ Penn or Sean Sherk. BJ Penn vs. Jens Pulver TUF 5 Finale Jun 23, 2007 (28:20) In a coaches’ clash and a rematch of their classic battle for the belt, former UFC lightweight champ Jens “Lil’ Evil” Pulver and his fight finishing fists faced former UFC welterweight champ B.J. “The Prodigy” Penn and his revered submission game. BJ Penn vs. Matt Hughes UFC 46 Jan 31, 2004 (15:00) By moving up a weight class to challenge a man considered to be one of the top pound for pound fighters in the world, BJ Penn was seen by most to be committing athletic suicide against Matt Hughes, who was making his sixth title defense. Someone forgot to tell Penn though, and the result was one of the most memorable moments in MMA history. BJ Penn vs Caol Uno UFC 34 Nov 2, 2001 (7:47) When top lightweight contenders BJ Penn and Caol Uno squared off for the first time at UFC 34, Penn avoided an orthodox attack from Uno to deliver one of the most emphatic stoppages you will ever see in an MMA fight. BJ Penn vs Joey Gilbert UFC 31 May 4, 2001 (10:46) Rising jiu-jitsu star BJ 'The Prodigy' Penn made his UFC debut against fellow UFC newcomer Joey Gilbert.